South Carolina State University (SCSU) is a four-year, state-supported, coed, liberal arts instituti…. 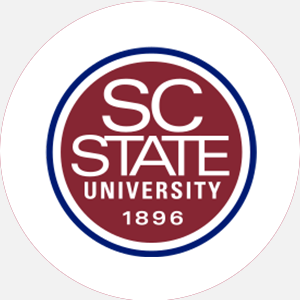 South Carolina State University (SCSU) is a four-year, state-supported, coed, liberal arts institution founded in 1872 as South Carolina Agricultural and Mechanical Institute. From 1872 to 1895, SCSU existed within the institution of Claflin College. In 1895, the South Carolina General Assembly enacted legislation for the severance of SCSU from Claflin. SCSU opened independent of Claflin in 1896 as a land-grant institution under the name of the Colored Normal Industrial Agricultural and Mechanical College of South Carolina. The name changed to South Carolina State College in 1954. With an expanded mission to provide programs in advanced study, the school received university status in 1992 and thus adopted its present name. Traditionally, the College has focused on teacher education, research, and service. As a land-grant institution, SCSU is committed to providing undergraduate instruction that combines liberal arts with vocational education. SCSU is also committed to community service, offering programs related to agriculture as well as adult and continuing education programs. The sixty-building campus is situated on 160 acres, with a variety of architectural styles. An additional 286 acres are located at Camp Daniel in Elloree, South Carolina. The campus facilities include the Martin Luther King, Jr. Auditorium, Henderson-Davis Theater, Hodge Hall, and Duke Gymnasium and Performing Arts Center, a state-of-the-art facility. South Carolina State University is accredited by the Southern Association of Colleges and Schools (SACS) to award the Bachelor of Arts, Bachelor of Science, and master’s degrees. Percentage of students receiving financial aid: 33 Financial Aid Specific to the School The Army and Air Force ROTC offer two- and four-year scholarships that pay tuition, fees, books, and other expenses, and provide a monthly stipend. Graduation from an accredited high school (or equivalent) and completion of the following units: 4 English; 3 mathematics; 2 lab science; 1 social studies; 1 history; economics; government (recommended); 1 advanced mathematics or computer science or combination; and 1 world history, world geography or western civilization; official high school transcript; cumulative “C” average; achievement tests and English composition test for counseling and placement; and a recent physical exam. A non-refundable application fee is required. Admission Application Deadline: July 31. Admission Contact: Office of Admissions, South Carolina State College, Campus PO Box 7127, 300 College Street, NE, Orangeburg, South Carolina 29117; Telephone: 803-536-7185 or 7186; 800-260-5956 (toll-free). A minimum of 120 semester hours and completion of core requirements to include the following hours: 6 mathematics, 6 science, and 1 computer course for math, business, engineering, and nursing majors; ROTC or four physical education courses; completion of Senior Exit Survey; passing of English Competency Exam; and last 30 hours in residence. Campus Regulations: All single undergraduates must live on campus unless residing in the city proper no more than 20 miles away; 2.0 GPA needed to participate in one of the various committees of the Student Union Board. Entering students must attend orientation. Campus Services: Health center, career counseling and placement, tutoring, religious services, and campus post office. Campus Activities: Social and cultural activities include theater, concerts, art exhibits, band, and religious activities. Students may work on The Collegian (student-run newspaper) or The Bulldog (yearbook). Communication majors or volunteers may work in the radio station WSSB-FM, which is owned and operated by the College. Timely information is provided about events within Orangeburg, Calhoun, and Bamberg counties. Leadership opportunities are found in the Student Government Association and numerous other organizations including social, honorary, departmental, service, and religious groups. Greek sororities include Alpha Kappa Alpha, Delta Sigma Theta, Sigma Gamma Rho, and Zeta Phi Beta; fraternities include Alpha Phi Alpha, Kappa Alpha Psi, Omega Psi Phi, and Phi Beta Sigma. Honor societies are also represented on campus. Housing Availability: 2,194 housing spaces; eight dorms for women; four dorms for men; married student housing available on a first-come, first-served basis. Handicapped Services: Wheelchair accessibility and services for the hearing impaired and speech disabled. August-May (semester hours) Commencement and conferring of degrees: May 9 Two summer sessions.